I'm always happy to discover new cruelty free and vegan companies, and my latest discovery has been Avalon Organics! I've recently been trying out five products from the brand, and today I'm giving one of my Canadian readers a chance to try them out for themselves! Avalon Organics uses certified organic, vegan, and cruelty free ingredients, what's not to love about that? 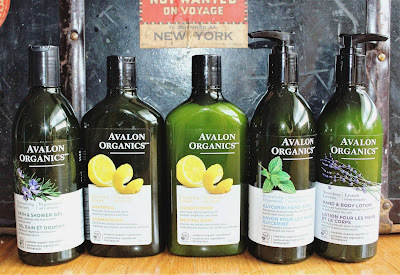 I've been testing out 5 of Avalon Organics best-selling products, and they did not disappoint. Avalon's Clarifying Lemon Shampoo & Conditioner* will win you over with the scent alone. It's super invigorating, and will definitely wake you up in the morning! I like to use this clarifying duo once every two weeks, as it does an excellent job removing build up. I only wash my hair twice a week, but I find that when I use this duo I can get an extra day or two out of my blowout. If you love the scent of fresh herbs, then you'll love the Rejuvenating Rosemary Bath & Shower Gel*. This formula combines notes of rosemary essential oil, calendula, aloe, orange peel oil, and lavender. This formula is super gentle and hydrating, making it an excellent option for anyone with dry skin. The Revitalizing Peppermint Glycerin Hand Soap* is scented with peppermint essential oil, orange peel, and calendula. The peppermint scent does linger on my hands for a little while after washing, and the formula is very gentle. If you're looking for a light lotion for Summer, then look no further than Avalon Organics Nourishing Lavender Hand & Body Lotion*. This light formula absorbs quickly, while still managing to provide long-lasting hydration. This formula is paraben free, so you can feel good about using it on your entire body. If you're interested in trying out these products for yourself, then head on over to my Instagram to enter my giveaway! If you don't win my giveaway, you can find Avalon Organics at Loblaws, Whole Foods, London Drugs, Safeway, Sobeys West, and Well.ca. What are your favourite natural beauty brands?